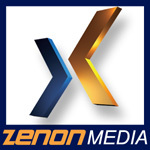 With the face tracking Zenon-Media add a new dimension in the visual automation. As soon as your camera are more or less on the right place, the tracking of the persons talking is done automatically. The face is recognized and size and position is given to visual radio to adjust for each camera the PTZ to have a perfect position and size of the person captured. The camera are not moved when person is on main output to avoid any focus problem and camera movement when he is on air. The camera stream is taken from a Video SDI input or better from a NDI stream, so analysing of the person can be done centrally for all the studio and any camera will be set from one place aven several visual radio are used in the radio building.